Weird West narratives are gaining in popularity: Seattle’s Steamcon made it their theme for 2010, the popular Deadlands roleplaying game is making waves in a re-release; Tess Fowler and Chris Gutierrez are hard at work on their martial arts steampunk western The Seven: Scarlet Fever; and a Jonah Hex movie starring the bankable looks of Megan Fox being released later this year, to say nothing of the success of Stephen King’s epic Dark Tower series and his Clint Eastwood-as-Aragorn protagonist, Roland. Building on this foundation, writers should find—to use a decidedly American metaphor—a veritable gold-rush of ideas for a steampunked frontier. My original intention with this post had been to go and see the Jonah Hex movie and comment on it (not just use the increase in interest), but between working on my field papers and being between gainful employment, I've had to settle for talking about Weird West and its relationship to steampunk, via one of the great masters of the genre, Joe Lansdale, and his work on the DC Vertigo Jonah Hex miniseries Two Gun Mojo and Riders of the Worm and Such. The cover of the second origin-story issues. It doesn't take a rocket scientist to surmise why this part of the story was radically changed for the new film version. More about that in my upcoming post on The Year the Cloud Fell. I grew up in a family that loved westerns: I dressed up as the Lone Ranger and watched reruns of Gunsmoke. As I grew up, I gained a love of horror as well. I owned Stoker's Dracula in grade four, and read my first Stephen King novel in grade six. So it's not surprising to me that I enjoy Weird Westerns. In fact, over the past month I've kept wondering (though not too seriously) if I should have done my dissertation on Weird West stories instead of steampunk. The term, at the very least, is far more indicative of the content (I don't think anyone is debating the definition of Weird West too vociferously): the EF describes Weird Fiction as "fantasy, supernatural fiction, and horror tales embodying transgressive material: tales where motifs of thinning and the uncanny predominate, and where subject matters like occultism or satanism may be central, and doppelgangers thrive" (1000). I don't think I need to define western for anyone. Wikipedia gives a more expansive definition, basically defining weird westerns as any western blended with another genre. This is a bit too expansive, as I don't think anyone would classify Blazing Saddles or Brokeback Mountain as weird westerns, despite the blending of western with another genre (comedy and romance). I sit somewhere in the middle of this: Weird West is the western merged with the fantastic, either SF, fantasy, or horror, with a dark tone to it. 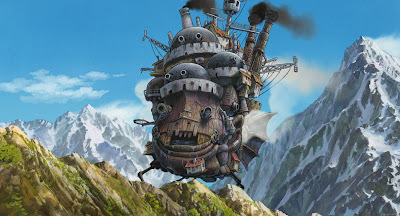 When it treads into SF ground, it sometimes utilizes a steampunk aesthetic. These are not necessarily interchangeable terms though: Not all steampunk set in America can be considered weird western: neither The Amazing Screw-on Head or Boneshaker would be considered a western. I remembered reading the Hex stories as being somewhat spooky, supernatural. 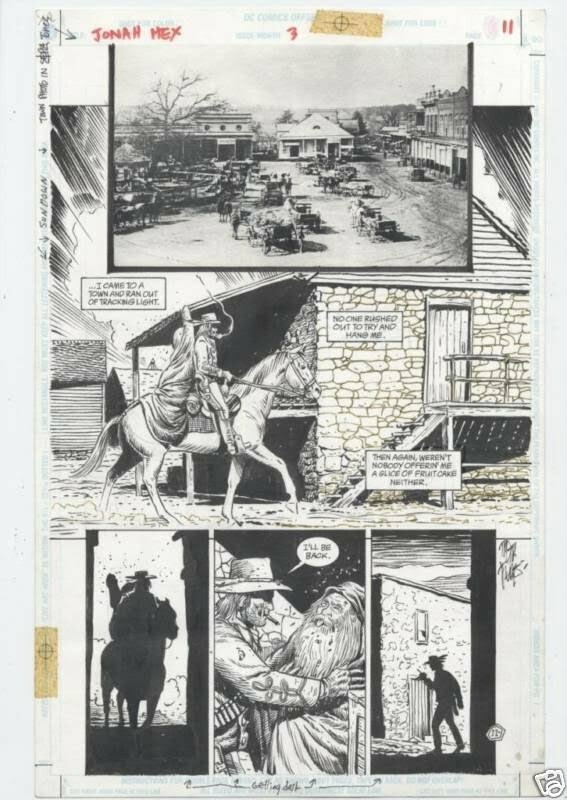 But when I began rereading those written by Hex's creator, John Albano, I was astonished to discover they were good, tough Western stories, but they weren't any supernatural elements. Nary a one. [...] This surprised me. My memory had played tricks on me [...]The old comics were great, but I decided I wanted to bring in the elements of my false memory, tie them to Albano's creation, and let the good times roll. I wrote my story to reflect the old Hex,[...] but I gave the story an echo of what I thought had been in the early Hex stories, but wasn't. I decided to keep it subtle however, so that the reader could, to some extent, read it either way-- as real supernatural business, or as real-life weird business. Perhaps the reason Lansdale's memory had played tricks on him was the way in which Hex comics were drawn. I'm thinking specifically of the cover to issue 9, which was drawn by legendary horror artist Berni Wrightson. There isn't anything supernatural about this cover, but I had nightmares about those ants coming for me. If being staked down in the desert as ant food isn't horror, I don't know what is (The quote by Lansdale was scooped from The Geek Curmudgeon's website, which has interesting background information on Lansdale and Hex, as well as a noteworthy anecdote about Rush Limbaugh and Lansdale's Lone Ranger and Tonto). 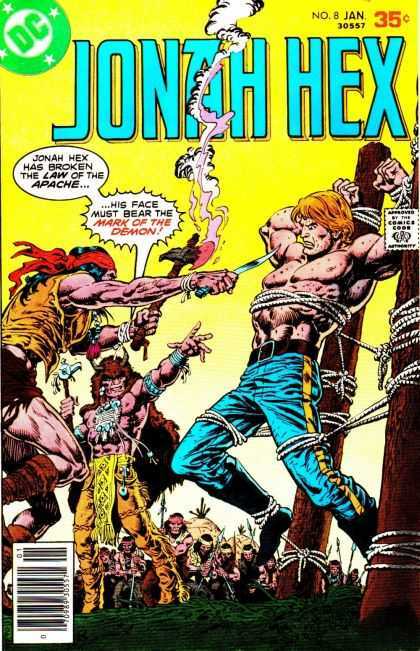 I read Jonah Hex as a kid in the '70s. 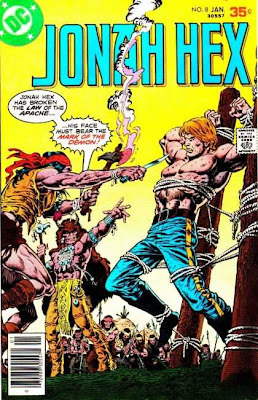 My uncle often gave me his comics after he'd read them, which was very cool, as cases like Jonah Hex, they were comics I'm not sure my parents would have bought for me. The first issue he gave me was #7, which was serendipitously the first in the two-part origin story. I liked Jonah Hex for the same reasons I liked Frankenstein's monster, Dracula, and Lon Chaney's take on the Phantom of the Opera: I was fascinated by Hex's scar, by the way in which he didn't deserve it but still came to embody it: Hex is a bit of a monster, not only by appearance, but often by deed. He lives by a dark code of honour, but it's a code that Roy Rogers wouldn't have been comfortable with. I used to grimace in front of the mirror and then stretch silly putty over my grimace to see what I'd look like if I was Jonah Hex. As an adult, I still see myself mirrored in Jonah, but more at the level of action rather than exterior. Jonah's scar externalizes the monstrous side of us all. Like Batman's Two-Face, he represents a dialogic of sinner and saint, monster and human. In issue 1 of Riders of the Worm and Such, he weeps for an old comrade's death, but pisses on his grave. 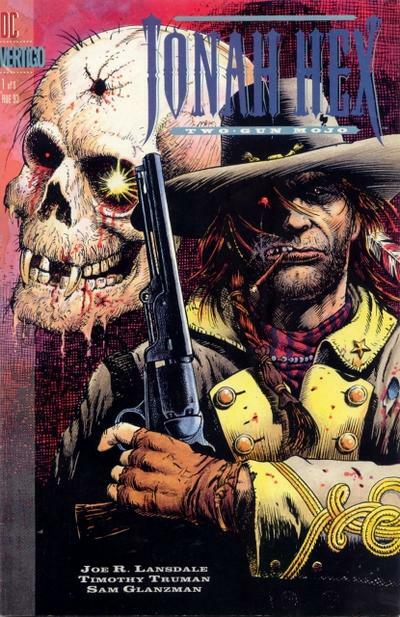 Lansdale's take on Jonah Hex has been both lauded and lamented. Those who enjoyed the reality-based darkness of the original series were disappointed by the inclusion of zombies in Two-Gun Mojo, and Lovecraftian monstrosities in Riders of the Worm and Such. While the zombies in Two-Gun Mojo do not require a supernatural reading, the Autumn brothers and their Dunwich-horror inspired mater cannot be read as anything but supernatural. Two-Gun Mojo is Lansdale's take on Jonah Hex, but Riders of the Worm and Such is Jonah Hex having crossed over into Lansdale's landscapes of intertextuality and insanity. I haven't had a chance to read Shadows West yet, but even without the third installment, one can already see Lansdale ramping up towards the writing of Zeppelins West: in Two-Gun Mojo's zombie resurrection of Wild Bill Hickock (who will go from a pickled, vivified corpse in Mojo to pickled disembodied head in Zeppelins); in the utterly hideous but also somewhat sympathetic Autumn brothers, confused and abandoned children who are echoed in the beast-men of Doctor Momo in Zeppelins. Throughout all his works, Lansdale maintains a dark and dirty humour of the sort that makes you laugh before you have time to feel bad about what you're laughing at. 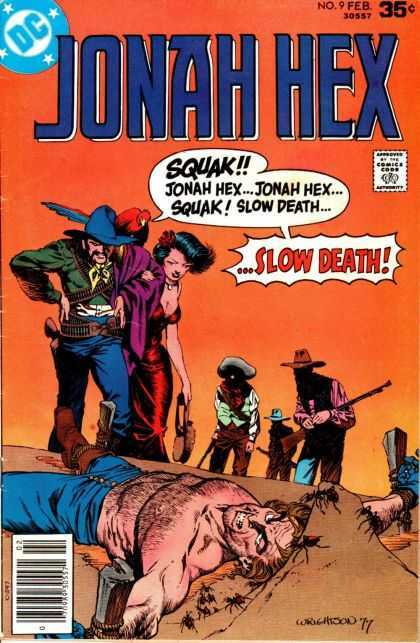 Landale consistently captures the morbid sarcasm of Jonah Hex's voice, sometimes juxtaposing contrasting image with text that would be benign but for its context. In the opening panels of Two-Gun Mojo, Hex's text-box ruminations inform the reader that "This here story starts one mornin' bright and early with me taking a little trip through the countryside." This text-box is the only text on a page of panels sequentially enlarging the scope of the reader's perspective, to show Jonah being dragged behind a horse to be hung. This gallows-humour runs throughout Lansdale's writing, both in his Hex titles and his Ned the Seal books. Lansdale's writing is like having a taste for hard liquor--those who like it love it, and those who don't do a lot of coughing and choking when they consume any. An example of Lansdale's gallows humour, as Hex rides into town with a friend's corpse on the back of his horse. Artist Timothy Truman utilized a number of period photos for the front page of each issue, wonderfully altered. You can see Hex with "the Kid", incorporating the famous photo of Billy the Kid. 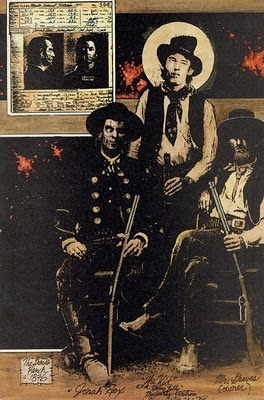 Regardless of whether you find his work contemptible or compelling, Lansdale is undeniably one of the masters of the Weird Western at the crossroads of the fantastic and the frontier. I wish I had time to say more on the subject at this point, but it will have to wait until I expand on it next month in my post on Deadlands: The Great Weird North, my October posting on the Deadlands RPG in general (for my Undead Steampunk month), and for my presentation on Lansdale and Weird West at Pure Speculation, and fingers crossed, Steamcon, in the fall. For the time being, let me recommend a few books and websites to take you further into this untamed and uncanny Old West. 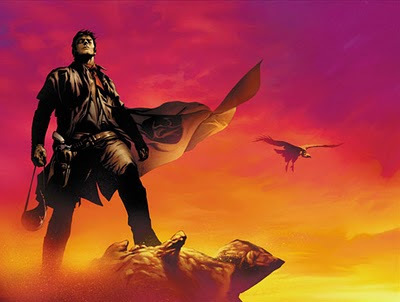 While I'm a big Stephen King fan, and have enjoyed as much of the Dark Tower series as I've read, I was especially appreciative of the story Roland tells his companions in book four, Wizard and Glass. Many people found it slow-moving, but I prefer the world of the Gunslinger without the crosshatch elements from our own, which is what I loved most about the first book. Accordingly, I'm a huge fan of Marvel's Dark Tower comics, which took the story from Wizard and Glass and adapted it as The Gunslinger Born. I'm currently reading the collected editions of the subsequent series, and have nothing but praise for the writing and the incredible artwork. Fans of Weird West who don't enjoy Lansdale's over-the-top irreverence and innuendo should give these a try. I'm only two chapters into Emma Bull's Territory, but I'm already hooked. Bull mixes the setting of Tombstone, complete with Wyatt Earp and Doc Holliday, with magic. At the outset, it isn't a mix of horror and western, but fantasy and western. Reader reviews on Amazon are largely positive, so while I can't endorse it unreservedly yet, it seems a good bet for the Weird West fan who can't take too much spookiness. As always, wikipedia provides a good introduction to the topic at hand, but for those who are seriously interested, visit Mark Adams's Weird West Emporium, which is to Weird West what my blog is to steampunk, only less pedantic. It has posts on everything from the recent Jonah Hex movie, to the Will Smith version of Wild, Wild, West, to games, comics, and this year's Weird-West-themed Steamcon. It should go without saying that tabletop gamers interested in Weird West should check out Deadlands. 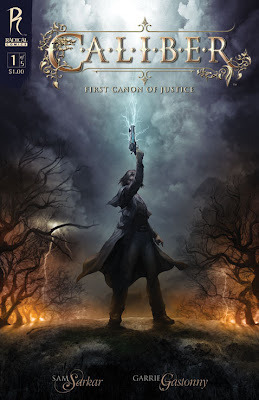 I'm personally very interested in getting my hands on Caliber, Radical Publishing's Weird West take on the Legend of King Arthur. Check out their downloads page for some great desktop backgrounds. These are the same folks who will shortly release Legends: The Enchanted, a fairy-tale in a supposedly steampunk world (although it looks more cyberpunk/post-apocalyptic to me). 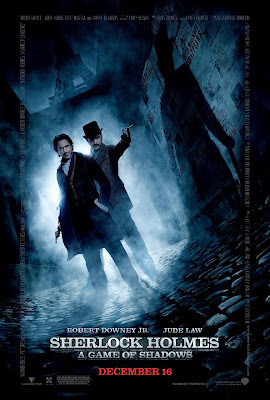 As a postscript, I want to link this great article about What Hollywood Can Learn From Jonah Hex, which sums up many of my opinions about what went wrong in the film's development. Thanks to Western X for bringing it to my attention. And hot on the heels of that link, let me send you over to Western X's main website: a weird west web series. It looks pretty cool, and it has Vernon Wells, who played mohawk-touting psycho-villain in theThe Road Warrior! For something far more scholarly than my post turned out to be, check out Noah Meernaum's erudite "Wounded Range, Part 1" over at Beyond Victoriana. Super fantastic article. No lie. Love this stuff. Thanks! I think I've also conveyed my love of it, and may seriously consider putting some sort of article together on Weird West stuff, using Lansdale as the case study. I always end up adding at least one book to my to-read list after reading one of your posts. . .
Oh, and if you end up liking _Territory_, you might also like _The Flight of Michael McBride_ by Midori Snyder. It's another western-meets-fantasy. I love western-meets-fantasy Niko, so thanks for the recommendation. I'm in a total western mode right now, since watching "Open Range" earlier this month.